Wow. That’s an amazing shot! Lovely photo! The breeze always kicks in whenever I try and take a photo of flowers! Luckily no breeze this day, and so many bees! oh we have both been chasing bees – love the colours. 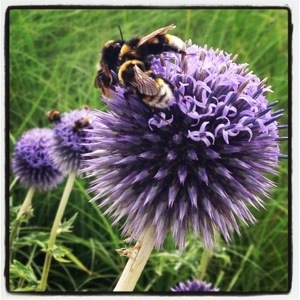 Echinops ritro is one of my favourite flowers and these bees think the same! Stunning photo! There were so many bees on all of the flowers, was amazing! A great capture – well done.